MERITON Suites has just completed a full, multi-million dollar transformation of yet another one of its hotels in Sydney’s CBD. Positioned within Haymarket and in the midst of the city’s vibrant Chinatown, Meriton Suites Campbell Street has been revitalised with a new stylish interior to promise a next-level accommodation experience for all its guests. Matthew Thomas, Group General Manager of Meriton Suites says it is vital for Australian hotels to go above and beyond as a means of surpassing the increasing, global expectations guests have during their travels. “2017 is the China-Australia Year of Tourism. Inbound tourists from China into Australia are an important economic driver and 1.2 million Chinese tourists visited last year, which represented a year on year growth of 20 per cent,” he said. The second hotel within the brand to have fully undergone a new generation of stylised design this year, all 247 suites at the Campbell Street hotel now feature new designer-inspired furniture, whilst incorporating sophisticated tones and contemporary details to reflect the higher standards that inbound hotel guests have throughout their travels. “Our aim was to ensure that we were able to provide them with a reinvented suite in conjunction with our warm and friendly service. We were able to achieve this just in time for summer and Sydney’s peak travel season,” Thomas said. Meriton Suites Waterloo, residing in the midst of Sydney’s suburban, inner-city neighbourhood, is the next hotel to undergo an interior reinvigoration of its suites. Scheduled to commence in January 2018, all 184 suites at the Waterloo location will feature a new quality of furnishings, consistent to its recently reimagined sister hotels at Campbell Street, and Pitt Street, which had been completed earlier in September. “We can attest to the ever-growing needs and standards of our guests and, having received such fantastic feedback both online and in person, it is clear to see that our reimagined suites live up to those expectations,” Thomas said. Along with newly revitalised suites, Meriton Suites focuses on providing exceptional services, in their provision of complimentary unlimited Wi-Fi in all suites and all areas of the hotels, premium furnishings including Vittoria coffee machines and pods, deluxe room service powered by Deliveroo, plus large TVs in all bedrooms with access to an extensive range of Foxtel channels, all to provide an incomparable guest experience. 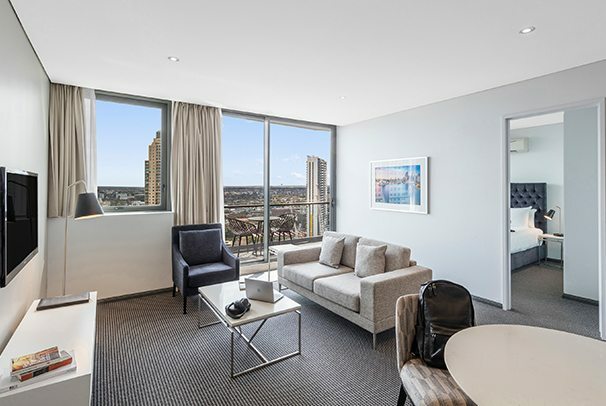 Meriton Suites, Australia’s largest owner of hotel rooms and among one of the country’s largest hotel operators, offers studios, one, two and three-bedroom suites in Sydney, Brisbane and the Gold Coast.